Resistors are probably the most common and well known of all electrical components. Applying a resistor to a circuit normally requires (1) calculating the nominal values needed in the circuit application (resistance, power rating, etc.) then (2) developing acceptable tolerances for the resistor that ensure it will function properly in all extremes of the application. The first design consideration is relatively simple, typically based on straightforward theory and linear calculations. The second design task can be more difficult because resistors have several characteristics that alter their nominal resistance value when used in a practical circuit. Here is a brief review of the important considerations and specifications. Resistors are often designated as "precision" or "power". Precision resistors are designed for applications where tight resistance tolerance and stability are primary considerations. They generally have restricted operating temperature limits and power dissipation ratings. Power resistors can also have tight tolerance and be quite stable, but their design emphasis is to optimize power dissipation. Power resistors generally have extended operating temperature limits. Resistor tolerance is the deviation from the nominal value. It is expressed as a ±%, measured at 25°C with no load applied. Some resistor designs have extremely tight tolerances. For example, precision wirewound resistors are made with tolerances as close as ±0.005%. Film resistors typically have tolerances of ±1% to ±5%. In applications like precision voltage dividers and networks, the designer should consider resistor sets matched for resistance or ratio tolerances. 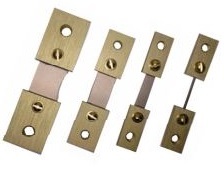 Often, these matched sets save cost over buying individual resistors with very tight resistance tolerances. Temperature Coefficient of Resistance (TCR) specifies the maximum change in resistance with change in temperature and is expressed as "parts per million per degree Centigrade" (ppm/°C). A wide range of TCRs are available to the designer (typically from ±1 ppm/°C to ±6700 ppm/°C) for specific applications. Specifying TCR is important in applications where the change in resistance with temperature changes must be small. Equally important may be applications where a specific TCR is required (temperature compensation circuits for example). Typically, there are two contributors to temperature-related resistance changes; the resistor's temperature increases as it dissipates power and also, the resistor's temperature is affected by the ambient temperature. Often matching TCRs for pairs or sets of resistors is more important than the actual TCR itself. In these cases, matched sets are available which assure that resistance values of the set track in the same magnitude and direction as operating temperature changes. Power ChartPower ratings are normally specified at +25°C and must be reduced as the resistor's temperature increases. A derating chart is often used. Since these parameters are application dependent, power derating curves or charts should be considered general rather than absolute. Power ratings are based on many factors. The safest designs use the largest physical size operating at conservative temperatures and power ratings. Temperature rating is usually the maximum operating temperature of the resistor. An operating temperature range is often specified: for example, -55°C to +275°C. Frequency response relates to the change in impedance with frequency, caused by reactive components from the resistors inductance and capacitance. Rise time is an associated parameter, relating the resistors response to a step or pulse input. Wirewound designs use special winding techniques to minimize reactive components. Typical reactive values for these special designs are less than 1μh for a 500 ohm resistor, and less than 0.8 pf capacitance for a 1 megohm resistor. A typical fast rise time resistor has a rise time of 20 nsec or less. In Aryton-Perry windings, a layer is first wound in one direction. After a layer of insulation, the next winding is wound in the opposite direction with the turns crossing every 180 degrees. Stability is defined as the repeatability of resistance of a resistor when measured at a referenced temperature and subjected to a variety of operating and environmental conditions over time. Stability is difficult to specify and measure since it is application dependent. Experience with practical circuits has given us some guidelines; Wirewound and bulk metal designs are best, while designs using composition materials are less stable. For highest resistance stability, it is best to operate critical resistors with limited temperature rise. Voltage coefficient is the change in resistance with applied voltage. It is associated with carbon composition and carbon film resistors, and is a function of the resistor's value and its composition. Noise does not effect the resistor's value, but can generate circuit errors in high gain and sensitive circuits. Wirewound and metal film resistors are best: carbon composition and film have high noise potential. The thermocouple effect generates a thermal emf at the junction of two dissimilar metals. In resistors, it is caused by the materials used in leads and the resistive element. It is normally insignificant, but may be important in high gain or critically balanced circuits and low ohm resistors. Thermal EMF is minimized by keeping the resistor leads and body at the same temperature. Reliability is the statistical probability that a resistor will perform its function. Normally, it is specified as Failure Rate per 1,000 Hours of Operation. Various statistical studies are used at arriving at these failure rates by testing large samples. Reliability is seldom defined for commercial products, but is a common requirement for critical designs such as in aerospace applications. Special low ohm power resistors are often used for measurement shunts, and for current sensing applications. The value of these resistors is low, often less than 0.1 ohm. Some special considerations apply. Lead material should be of good conductivity to prevent the lead resistance from becoming a significant portion of the total resistance. Measurement points should be specified for critical applications; a point 3/8" from the end of the resistor body is universally accepted. Four terminal leads are often specified for low ohm current sensing applications where lead resistance is a significant factor in total resistance. The Kelvin connection removes the voltage drop error in the current leads, since the sensing leads are attached at a fixed point and carry no large current.